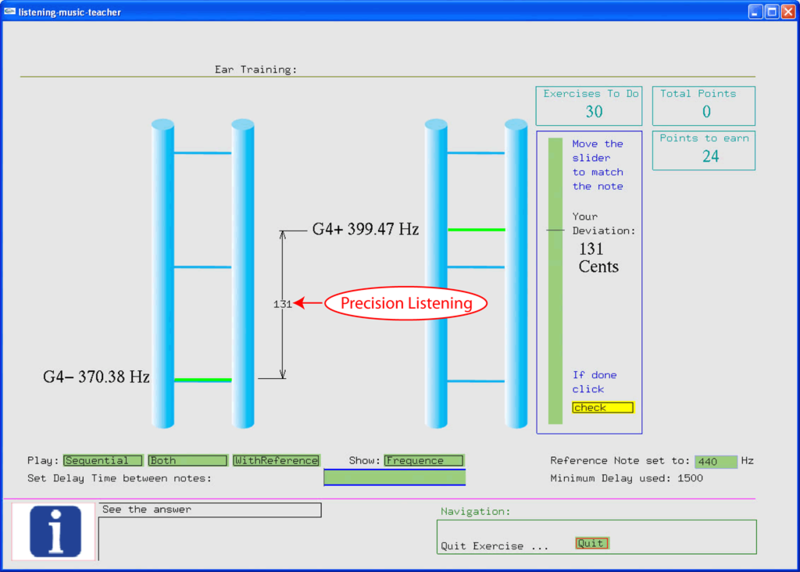 Many ear training programs exist. They all have their advantages and disadvantages and they all emphasize on some special aspects of ear training. We are no different. Our emphasis lies on feedback. That means: we don't have a textbook approach, where you get in-depth information on how to train your ears. Nor do we specialize in ear training through audio listening to popular songs, Nor do we specialize in video presentations do bring you ear training nearer. Of course we make use of audio samples, and we use video to explain certain content. But the main point in our ear training efforts are exercises. Exercises that use randomized tests, so you never can predict an answer from where you are in the course (for example a review block at the end of a chapter in a text book will never change, but our exercises are randomized). And most important, we believe in feedback. To make progress you must be guided to the right directions with appropriate feedback. You should also be able to see that you made progress. Therefore we evaluate and score your efforts. Only a software approach allows to be interactive. We believe that active learning (by doing) is the best way to learn something. Listen to songs and try to sing them. Start by just repeating one note and gradually increase the number of notes. Singing is the only activity that has the instrument built in: the voice. Singing is not only pitch: you also have to account for the timing: rhythm. The best way to get a handle to rhythm is: rhythm-counting and clapping exercises. Understand the basic musical concepts. First find out the concept of intervals: the relative change of pitches in melodies. And then continue to the simple but most powerful concept music has: triads. Also continue to improve your precision listening with special exercises that challenge your listening skills to the cent. While we agree and also say that relative pitch is more important than absolute pitch, we still think that starting to go along the path towards absolute pitch is a worthwhile training. 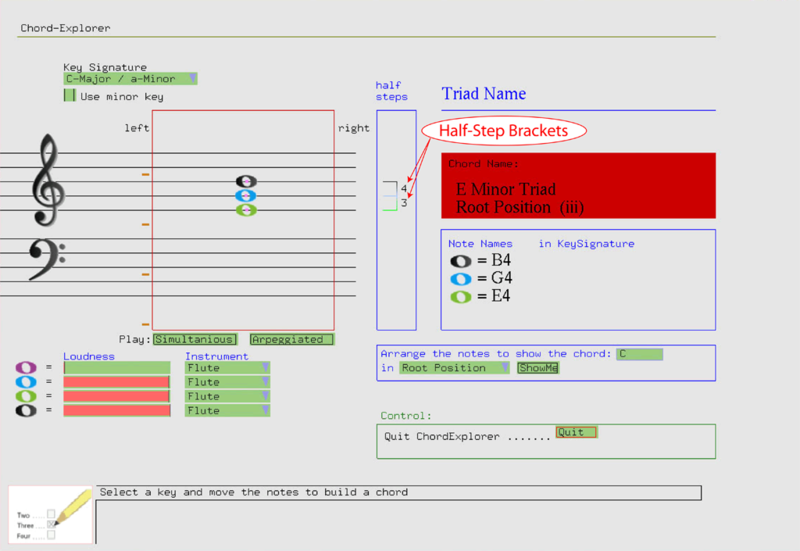 It tells you where you stand on this path and helps you to build a grid to fit single notes and intervals. The importance of tuning is often underestimated. However, tuning is a necessary step for every performance. TuneCrack has exercises to improve your listening skills and your pitch transfer skills. PitchBlitz is a relative pitch training program.. Even so, I believe that singing is the best approach to music, PitchBlitz does not require you to sing. PitchBlitz focuses on pitch-distance hearing. Accurately hearing and describing pitch-distances requires a high degree of concentration. Especially if you assume that for relative pitch: "Speed is everything". While everything can be viewed as relative and therefore any absolute reference point is of no importance, sometimes absolute definitions help to simplify communications. At least we speak more or less about the same dimensions. In Western music every piece is layed out around a key signature. Each key signature has a corresponding tonic. For example the key of C has the note C as the tonic. Therefore, if can keep the tonic for the whole duration of the piece in your mind, you less likely risk to drift off key during a piece. The program Same Pitch Please focuses on the skill to improve your absolute pitch memory. Our notes contain a red dot showing where the target pitch is. This visualization allows us to give feedback in the singing exercises. Pitch feedback was used by the first music teachers, thousands of years ago. The teacher was probably rising or lowering his hand to show the student where her/his pitch was compared against a target pitch. But only with the arrival of computers it was possible to give automated and neutral feedback against a target pitch. Many studies show that singing is the best way to improve pitch sensitivity. The right feedback helps us to sing in tune. Below you can see: The Red Pitch Dot and The Colored Pitch Line. Ear training also applies to rhythm. Clapping exercise allow the computer to analyze your rhythmic precision. That means we can give you visual feedback where you can see if you were early, late or on spot with your clapping. In addition the flexibility of software allows us to superimpose counting hints. This is especially helpful for beginners. For rhythm exercises counting is the basic skill to learn. 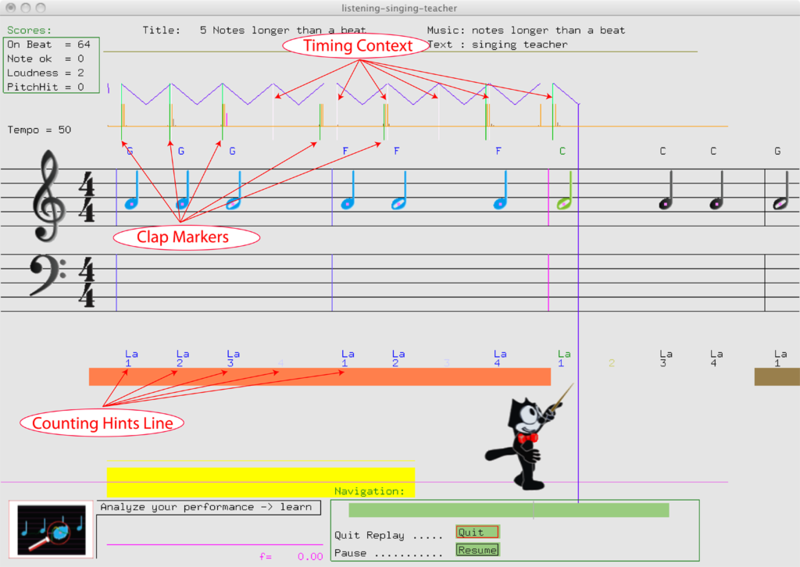 Feedback helps you to identify timing problems: the clap marker lets you easily see your clapping in the timing context..
Intervals and chords are relative pitch concepts. Therefore, a relative measure is used to describe the distance between any two notes. In the case of Western music the equal tempered scale allows us to give the distance between any two notes in half-steps. To visualize this fact, we have introduced the Half-Step Brackets. Since ear training is an important part of music understanding, we have introduced a new method: The Precision Listening Method. Our ear training method forces you to listen really carefully: after hearing two consecutive pitches, with a variable pause in between, you must indicate whether the second pitch was higher, lower or the same as the first pitch. Starting with the distance of a half step, in the first ear training exercise, the pitches to discern get closer with following ear training exercises. Until you have to discriminate pitches that are only 12 cents apart. The last ear training session lets you differentiate pitches up to 1 cent. In this last exercise the distances are randomly chosen, and are no more in relation to the equal tempered scale. That is, the first pitch does not necessarily coincide with a pitch assigned to a note in the equal tempered scale. In addition, you have to keep the first pitch very close in your mind, since by moving the slider to the matching position, the pitch of the slider position will be sounded. Thus this sound will distract you from the first sound that you have to keep in mind to move the slider to the correct position. The above sample shows an exercise from the type "Differentiate pitches up to 1 cent". In this case the played sound was 370.38 Hz, which is slightly above a F# (369.99 Hz). In this sample the slider was moved up to 399.47 Hz instead down to the played sound. Therefore, the deviation in cents was: 131 cents. G4 (392 Hz) is the middle step of the scale. 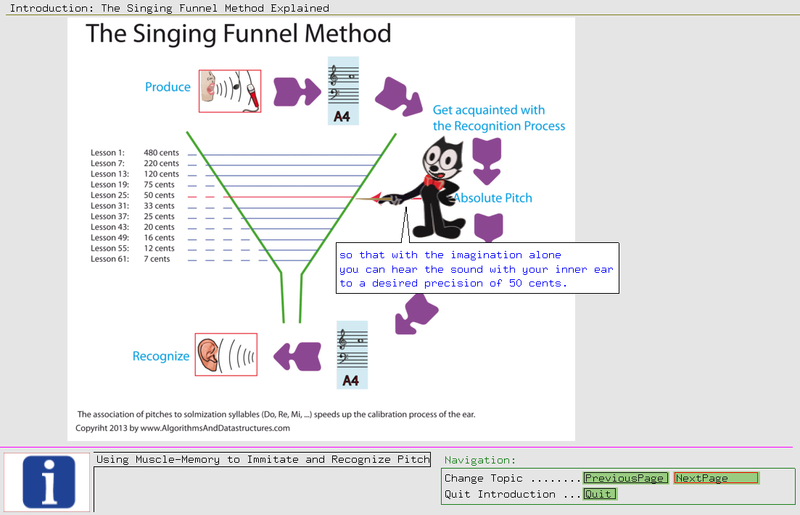 The Singing Funnel Method uses a learning box to move correct remembered pitches through the box. In the beginning the learning box asks you to start with only two notes (you select) and accept pitches more than two half steps apart as correct. This large tolerance is necessary to build a foundation that you can improve. In the beginning you may even have problems to achieve this level. Since the brain will very fast switch to relative pitch methods, we recommend that you start the day with ear training before doing any other musical activity. If you want to continue the training with this method, we recommend to switch to the training mode after 5 minutes. In this way you get a better overview on where you stand. 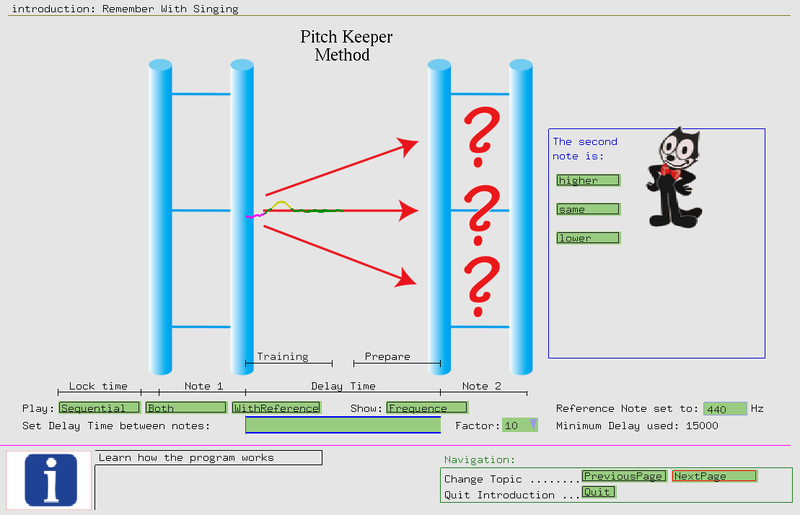 The Octave Anchor Pitches Method also uses a learning box method for score keeping, but doesn't require you to sing. The main goal is to build a grid to get an overview where the pitches are located. The method starts with pitches an octave apart. This will give you easy to locate Anchor Pitches on the grid.The method continues to subdivide the Octaves to ever smaller distances. 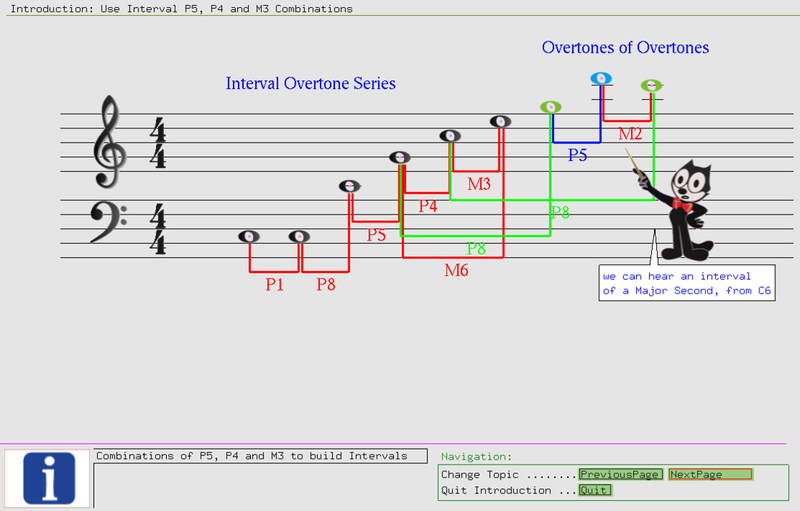 The Interval Overtone Method trains you to hear harmonically played intervals by learning to listen for interval characteristics. The Method goes along the overtones. In this way you have to learn to distinguish the most difficult to distinguish intervals first. This may sound strange, but this method allows you to build a repertoire and expand the repertoire by exclusion of the already learnt intervals. 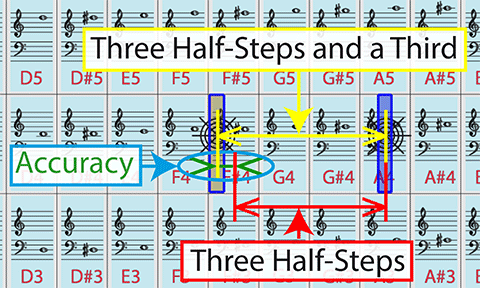 The Half Step Change Hints Line shows the change from the previous pitch in half steps. This is useful for the listening training of intervals. Since you do not have to extract the change yourself you can learn to hear pitch changes in half steps by simply looking at the hints line. If you are a beginner, and want to learn the note names it may be useful to have the note names displayed along the staff notation. Instead of the scientific pitch notation, you can also display the degree number of the note. This is especially useful if you want to learn to understand the music by function. The degree notation shows the notes degree in reference to the tonic of the piece. The Note Notation Hints Line also allows you to show the absolute or relative solfege syllable notation.To easier differentiate the notation hints each one has its specific characteristic: The degree number is displayed with a caret above the digit. The relative solfege syllable is shown in paranthesis. As an example the degree notation is shown (note the carets above the numbers):. There is a point in time where absolute pitch meets relative pitch: Usually people can, - after a little training -, tell if a note played after another note, is higher, lower or the same. To answer this question correct, the time between the two notes just has to be small enough. To answer if a sound is higher or lower is a relative pitch question. Now, if we increase the time between notes that are a half step apart, to a day, then if we can consistently answer the previous relative pitch question correctly, then we can speak of absolute pitch. That is, because absolute pitch is nothing else than to remember a pitch as a reference point. And if we can remember a pitch a day ago, then chances that we can remember pitches even after a longer time are very high. Now, between the notes following each other immediatly and a whole day, there are a lot of other time points. The time in within which, we can still answer relative half-step questions correctly, we call: your personal absolute pitch point. This point may be much less than a day, but it can be used as a measure on how far away from absolute pitch you are. With training you can increase the time between the notes: see Pitch Keeper Method. With the Pitch Keeper Method you have to answer the relative pitch question: Is the second note played lower, higher or the same. The time between the notes can be increased from 0 to 1500 seconds. In the beginning you may answer the pitch questions only correct, if the time between the notes is less than 1.5 seconds. Through training you can push this time to 2 seconds. and so forth. Since there is nothing nearer to remembering pitch than to produce a pitch, the method supports your pushing of the limit, by letting you sing the heard first note. The colored pitch line feedback gives you the necessary confidence that you have taken over the pitch correctly. Try to remember the muscle positions you use to produce the sound. Before the second sound starts, a white noise signals you that you should prepare yourself for the question. To do this, recall the muscle positions from your muscle memory and sing the note again. By correctly reproducing the sound, it gets easy to answer the question when the second note is sounded, since the reference note is now less than 1.5 seconds away from the second note. 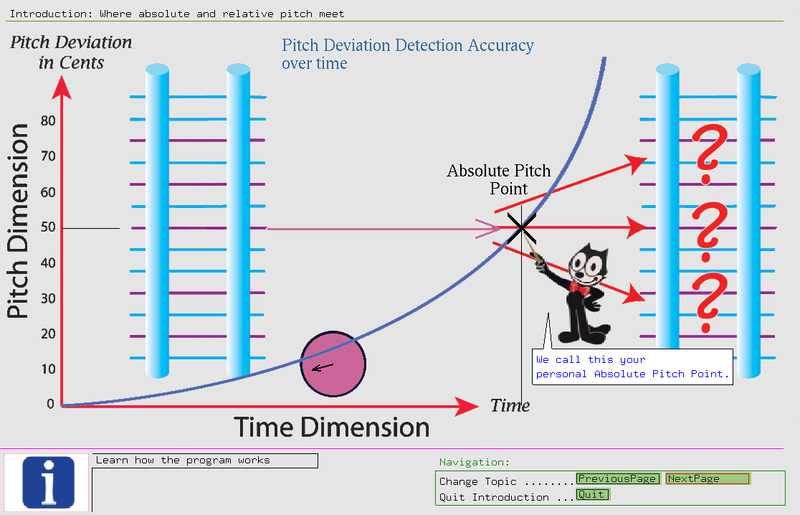 With the Pitch Ability Method we guide you to improve your absolute pitch memory. The Pitch Ability Method is similar to the Pitch Keeper Method. However, instead of just listening this method involves producing a sound. As a first step the method helps you to identify which notes you can produce and remember best. In a second step you find when your short-term memory starts to fail to remember a pitch. This point in time we call: your personal Perfect Pitch Point. With training you can push your personal Perfect Pitch Point to larger time periods. By doing this you learn how to transfer your short-term memory to your long-term memory. In other words, the Pitch Ability Method gives you a handle to grasp the mechanism on how pitch memory functions. The Pitch Ability test is a scientific approach to measure your pitch ability. To pass the Pitch Ability test for a certain time, you have to select four notes that you can sing or hum well. The test will play the first chosen note. After the note is played you get two seconds to sing the heard note (no feedback will be given during the test). After that a pause of silence of the chosen ability time you want to test follows. Five seconds before the pause time finishes you are allowed to hum or sing again. To pass the test for a note you must sing the note back within a precision of 50 cent for one second. If you pass the test for all four notes chosen, then you have passed the pitch ability check for the chosen time. 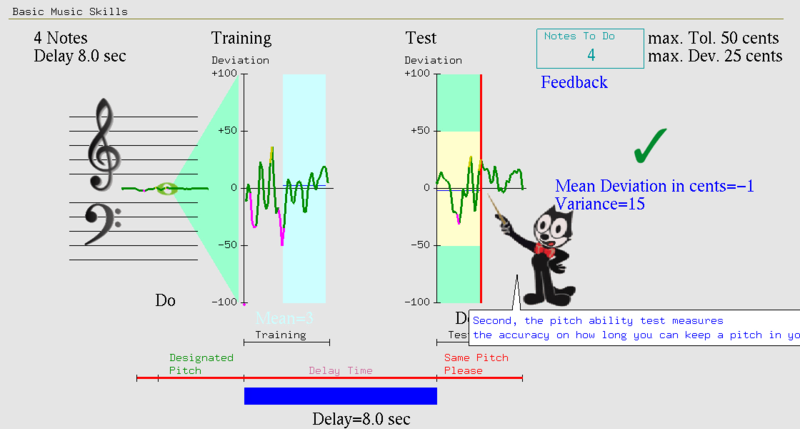 To give you a mark that you can use as an orientation point, we have defined Felix's Pitch Point at four minutes for the Pitch Ability test. The Pitch Ability Test should help to demystify the term Absolute Pitch (or Perfect Pitch). 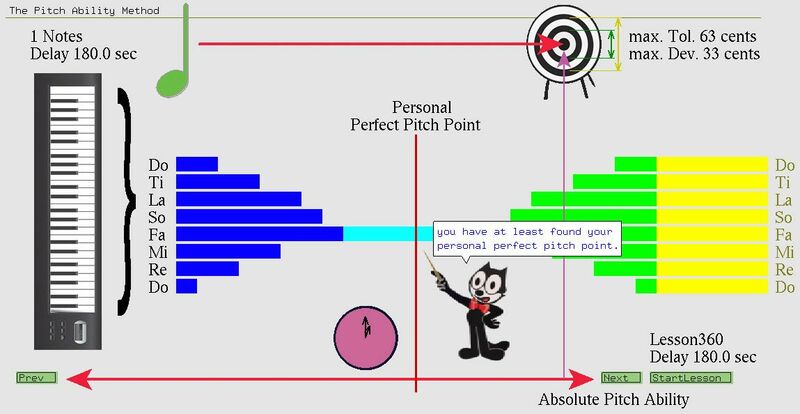 On the ipmortant point "Accurately sing a named pitch without a reference" the program evaluates your standing on the road to Absolute Pitch. By giving you graduaded feedback, the program dives you a hint on the effort you still have to do until you succeed. Since the test measures how well you can take over a pitch, and how long you can retain a pitch in your mind, the test is not only useful for aspiring Perfect Pitch searchers, but also for beginners. Especially the first point is very important for beginners, since if you want to play in a group, it is necassary to be in harmony with the other band members. Being able to keep a pitch in your mind, helps you stay in tune and understand music from the point of the tonic. While the Pitch Ability Test measures your ability "How long can you keep a reference tone in your mind" the Pitch Grid Test measures your ability "How good can you discern pitch-distances". 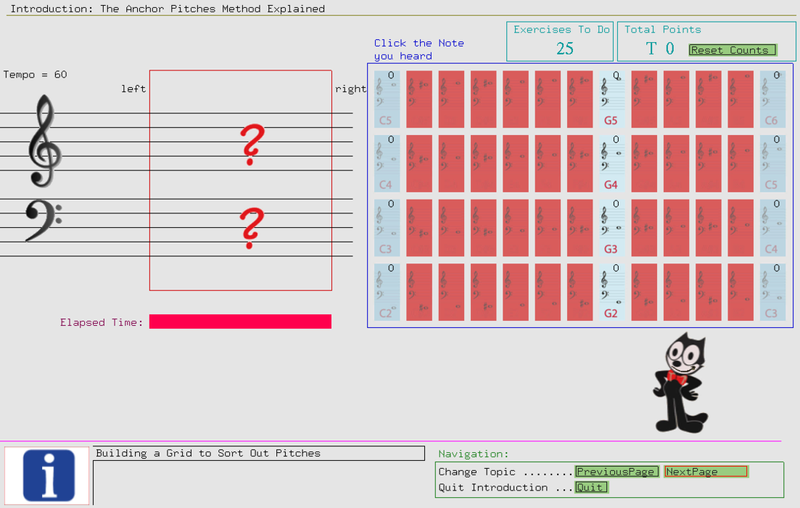 PitchBlitz is a training program that prepares you for the Pitch Grid Test. Since the Pitch Grid Test is a relative pitch test, time is important. In contrast to other relative pitch training programs, PitchBlitz goes beyond the usual interval precision. The Pitch Grid Test evaluates your pitch-distance hearing ability in cents. The score is not only dependent on the precision, but also on the time used to perform the task. The task consist mainly of two abilities: first, to recognize a distance, and then, second, to express that distance in a quantity. Since the quantity is expressed on a grid, non-musicians can do the test as well. Of course, by using the equal tempered system as a grid, the standard piano tones are preferred. However, the pitch-distance hearing ability is also tested from reference tones that deviate from the standard piano tones. So, by favoring equal-tempered frequencies, the test is not a truly random distance-test, but still allows the measuring of your pitch-distance discernability with ascientific approach.